For those of you familiar with the fair village of Danbury, the kind red-brick facade of Frettons, stood by the church, will hopefully be no stranger to you. Thus, allow me to further familiarise its name by producing here this minor history of the place. The name of Frettons appears to originate in late Medieval England, when a man called Thomas Freton came to Danbury. His family may have already lived in the area for some time, since a John de Fretoun owned land in Little Baddow in the 1370s. By 1453, at least, Thomas Freton was residing in Danbury with his wife Alice and at least one son, also called Thomas. Surviving documents suggest he had already come to own significant land in Danbury at this point, so it is not too unlikely to suggest he was descended from the landowner John de Fretoun, alive a century earlier. There are two apparent possibilities for the origins of Thomas’ family name; it may either be related to a location, such as Fritton in Suffolk, or it could come from the old English word fretan, which means to consume. The location option seems more likely, and would give an idea of where his family line comes from; it could even be a corruption of Essex place-names such as Frinton. Whether Thomas built a house on the location of the current Frettons is unrecorded other than in the name of the house that still lives on today. He was certainly a wealthy enough land owner and would have had himself a reasonable home somewhere on Danbury Hill. There is, therefore, nothing to suppose that the place still bearing his name could not have once been the site of his original Medieval hall. Thomas the elder appears to have died sometime in the 1460s, and his son took command of the household. His life is as patch-worked across the record books as his father’s, although it is possible that he married a woman called Katherine, and more than likely had a son called Henry, who appears in court records relating to Danbury in 1493. This Henry Freton, most likely the third of his family line to occupy that small spot next to the church, is as obscure as they come. His name is recorded once in all that survives of those early-Tudor days of Danbury, and there is no evidence of him besides. This, however, is the foundation of a family name that still lives on today as the name of the house that they built. Frettons seems to diminish into obscurity following the lone mention of Henry Freton at the close of the 15th century. Two different men with the surname Fretton are listed as jurors of the hundred of Chelmsford between 1564-66. These were Thomas in 1564, who failed to respond to the summons, then John the year after, and Thomas again the year after that. Whether these men were the descendants of the family at Danbury, and if so whether they owned the house there is unclear, but 1566 Thomas’ name appears right night to one Glascok, another family that was well established in Danbury. Evidence in the building itself, though, seems to suggest that the owners suffered no particular ill-fortunes during these years, since there were several new parts of the house put up that still stand today. This, though, is the only hint at the possible fate of the family who built Frettons, and it is not until 1639 that there is any further mention of the house. ‘Fretons’ is listed in a deed dated 1639, and along with this deed are listed several fields that belonged to it. For such a large property in such a significant location it may seem odd that its mentions are so few over the sixteenth and now into the seventeenth century – however, similar sized properties in Danbury such as the Dukes or Peppers [the Griffin] get similarly spotty mentions in deeds and documents throughout the years. What became of the house after the deed was drawn up in 1639 is again unclear, perhaps it remained a farmhouse of another obscure family, perhaps it became an alehouse and was numbered among “Garrington’s”, “Mother Pod’s”, “Coker’s”, the “Lodge”, or “Marshall’s” – all pubs named as existing in Danbury in the 1630s and 40s. Ogilby doesn’t give the building any particular definition in his small map of Danbury in 1675. Some parts of the existing structure date from the 17th century, and show that work carried on improving the house. A new kitchen was added and other small parts of the building were at least changed. 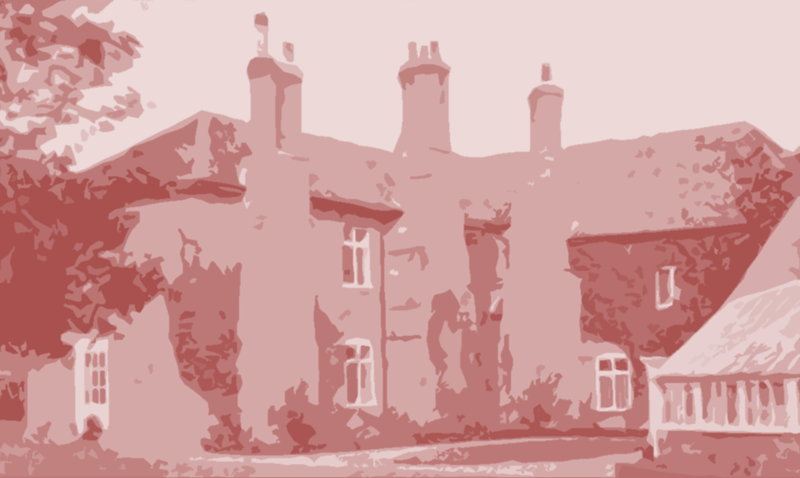 Any further additions to the house at this time have not survived, but certainly it would have been a significant structure by the time that the century closed, and it is here that evidence appears of the Nicoll family coming into ownership of the house. The Nicolls appear to be an ancient family, and I can trace their presence in Chelmsford back until at least the fifteenth century. When they moved to Danbury is unclear, but a grand tomb slab in the church belongs to a Nicoll suggesting their arrival in Danbury to be before its date of 1683. They were certainly resident at Frettons by the mid-18th century. Some of the façade of the building may date from this century, and certainly the building seems to have been well modified and modernized, but the exact nature of its owners are not clear. I am informed, though with less evidence than any story I know, that it was for a time a girl’s boarding school. It is very possible that if that story is true, then it may have been around this time that Frettons indeed was a school, although the lack of records of a school in Danbury at this date does add reasonable doubt to this tale. Certainly, though, it was around this time that the approach to the house was changed and the location of the main gate moved from central within the front wall to the left hand side. The house is still undocumented in the early 19th century, until finally it is bought in 1880 by John Timbrell Pierce, a lawyer and later Justice of the Peace for Essex. Here we know for sure something about the owners of the building for the first time in centuries. John brought up his family there as well as managing a small household of servants and improved the house with his own changes. He remained there happily retiring from the law, and finally died there on 18th July 1909 at the age of 78. His wife, Mary Jane Pierce, appears to have carried on living there for only a year or so following his death. All changed again in 1914 when the first world war broke out and the army began creating training camps across the country. A camp was set up in a field south of the house and indeed the house itself was confiscated for military use. Soldiers used the house as a base for the duration of the war, and they left their own mark on the history of the village. This was not the only time that war would shape the fate of Frettons, and it was on 20th May 1940 that a German plane, lost in low cloud while searching for Chelmsford, saw a spire pointing out of the murky fog below him and dropped several bombs. Aside from destroying one end of the church, one was a direct hit on Frettons, damaging several parts of the house. It was repaired by Bakers of Danbury under the designs of Wykeham Chancellor, architect. Much of the current more modern appearance of the front of the house is down to these repairs. The house, at last, returned to more peaceful times and was sold to the Dawson family, who owned the house until late on in the 20th century. And that is a short, honest, and sadly spotted history of Frettons of Danbury.